I sure got excited several years ago when a trip to my mailbox netted me a large, white and black certificate that had Governor Beshear’s name on it, along with these words neatly printed below his: ”Honorable Steve Flairty is commissioned a KENTUCKY COLONEL.” To this day, I don’t know who made the nomination, but it sure was a gesture I’ll always appreciate. I do know that the individual, by the rules, had to be a Colonel first. I’d like to report that becoming a Kentucky Colonel changed my life in amazing ways, but that would be a stretch. In fact, I suspect that if I’d take the certificate to my local coffee shop today and show it as I order my coffee, the cost would still be $1.90 and not discounted. But maybe that’s the wrong way to approach the honor. I pondered my Kentucky Colonelship and its meaning recently after pulling the piece of paper out of the bottom of the trunk sitting next to my small couch in the study. What is the piece of paper all about and what does it mean to me personally? After some quick research, I became a bit surprised about the issue. First, the nominations and awarding of the honor are processed through the governor of Kentucky’s office. I knew that, but I then found that there is a follow-up part of the process. According to information on the Kentucky Colonels website and confirmed later by my talking to its executive director, Sherry Crose, one who receives the recognition is “commissioned a Kentucky Colonel for life.” However, to be considered an active Kentucky Colonel, an annual financial gift to the “Good Works Program” of the 501(c)3 non-organization is required. The money donated to the Good Works Program is used to help vetted charitable agencies around Kentucky carry out their good works. In 2017, about $1.5 million were granted in the form of real, or “tangible” gifts to 171 agencies around Kentucky, noted Crose, with about 50,000 active members contributing through their annual contributions. With that information absorbed, I notified the Kentucky Colonels organization in Louisville that I wanted activation status and promptly delivered my contribution online, a relatively easy process. Being an active Kentucky Colonel now feels, for me, like an investment in the state’s goodwill. I look forward to staying active in the future and keeping watch over the good the program does. Curiosity also spurred my interest in checking others’ experiences regarding what is often termed “The Honorable Order of Kentucky Colonels.” I received some interesting reactions. David Greene, Winchester, was recognized last year as a Colonel after being nominated by a Future Farmer of America officer and State Representative Donna Mayfield. 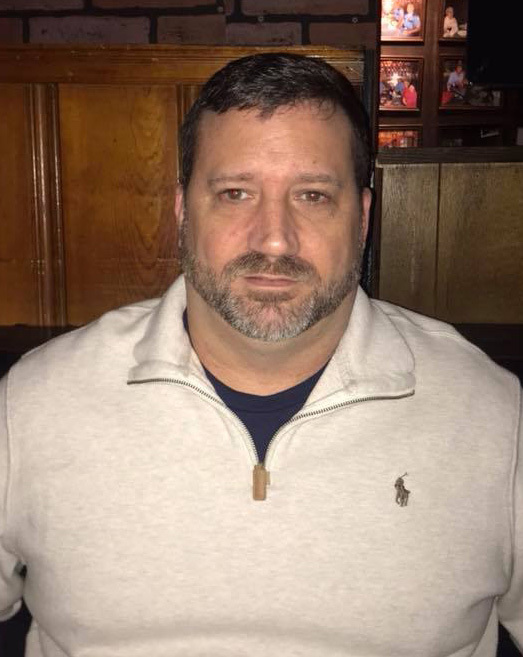 The U.S. Army veteran received the recognition for coaching youth baseball for 20 years and leading a ministry program at his church that helped feed underprivileged children in his community. 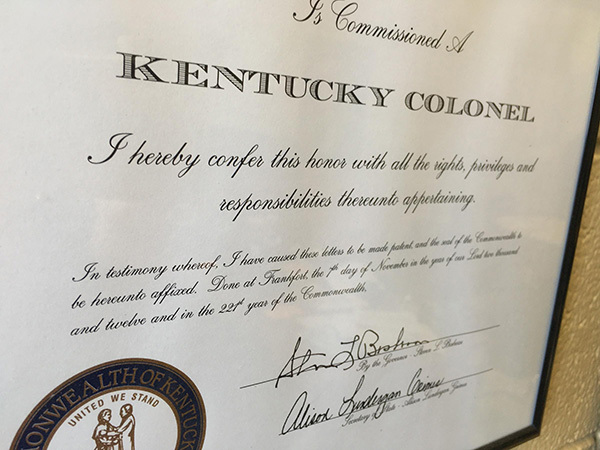 Being a longtime advocate for our country’s military veterans has encouraged Ballard County resident Sandy Hart’s friends to nominate her as a Kentucky Colonel more than once. She received the recognition after being nominated by a local businessman in 2004 when she organized 17 busloads of individuals, mostly veterans, for a memorable trip to the World War II Veterans Memorial in Washington, D.C. Afterward, she kept getting more Colonel certificates through the mail. “After about six,” she noted, “I called the Governor’s Office to see what was up. The lady chuckled and said they just kept getting notifications from WW II veterans from around Kentucky wanting me to be made a Kentucky Colonel.” Sandy is the founder and director of the Kentucky Veteran and Patriot Museum (http://kygrro.org/kvpm/) in Wickliffe. A long-time technology teacher in Kentucky still proudly holds on to his Colonel designation as a retiree living in Knoxville. He recalls with amusement the circumstances involved when he was notified of his honor in 2009. Andy worked to have a Colonel nominate and confer the commission on a dignitary in his national technology association during an important conference–a big surprise. But something unexpected, and positive, happened to Andy also. 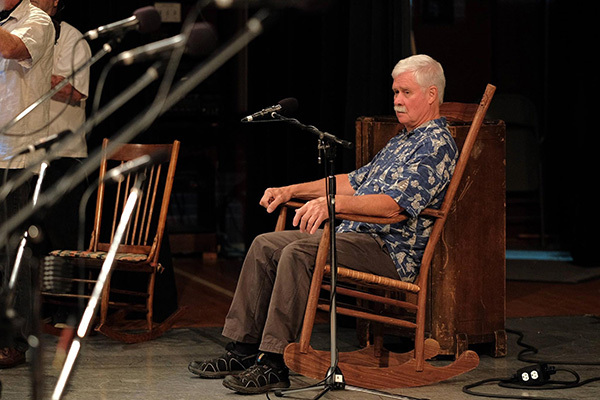 “We managed to pull off the surprise, but the larger surprise was that I was called backed up on the stage and was conferred as well for my work in two other associations.” Paying it forward, it seems, may well bring good returns. And though no program like this is without a need to improve, I get the feeling that people in the Bluegrass are generally happy that it exists…and wouldn’t mind having Colonelship on their resume. Doris Settles of Lexington shed some interesting light on her experiences. Count me as glad to wear that designation, too, and I’m planning to nominate another deserving person or two soon who can add to the mission of the Good Works program. For more information, visit governor.ky.gov or www.kycolonels.org.